2012 is almost over and with that we fired up our google analytics account to see which stories had the most views during the year. With that said, look for posts daily counting down our top ten stories of 2012. There appears to be a theme with all of the restaurants that opened in 2012. We hear about them in 2011. We hear rumors about them in early 2012. We hear about an expected opening date in spring. That doesn't happen. We hear more rumors. We see some action. And then they finally open. 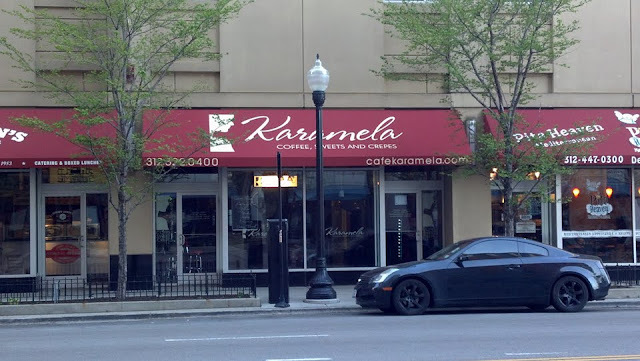 That was the case again for Karamela Cafe (1250 S. Michigan). First we heard from someone in Pita Heaven, the next door neighbor, that "something" was coming to this space but they couldn't tell us more. This was in December of 2011. Then a reader wrote to us and gave us some news that it was going to be a cafe/pastry shop and was aiming for an opening in Early April. 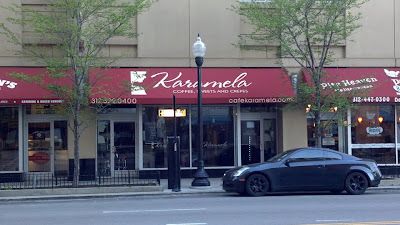 That seemed to jive with what we were seeing on the ground as an awning went up for Karamela Cafe in April. After months of little to no action, people were getting skeptical. A reader tipped us off to a facebook post stating that the owner ditched the concept and employees they hired (this was in September). A couple weeks later, it appeared that something changed and the cafe was moving forward as a slew of internet activity picked-up. Sure enough, on October 9th they Karamela Cafe was open! Intrigued by the new option we ventured in for a dinner and were pleasantly surprised. The best thing about it was the quality of the food and the unique offerings they brought to the neighborhood. In our opinion it was refreshing to have new options that weren't available in the Sloop. While Karamela Cafe is occasionally busy, it seems like it could use some more support. With that said, check it out if you haven't...you will be surprised! I agree, these are the type of places we need to support. Whenver I am up north, these places are jammed packed. We all complain about wanting more options and "cafes", but it seems people don't make a conscious effort to go or just order something for carry-out. 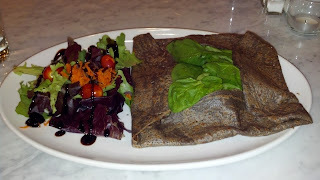 I love Artist Cafe, Karamela, Little Branch and Overflow - I just wish one of these opened near Cermak and Michigan area. A real cafe or breakfast/lunch spot with solid ownership. This post is not about Karmela (nothing worth posting on that front). However, as I'm certain that something about Motor Row will be one of the top three stories, I wanted to direct all of you to Mary Mitchell's story in today's Sun-times about a woman who lives at 21st and Michigan ("the southern gateway to the sloop"). Trust me: that building, and those surrounding that building, are full of families like this woman's family. This is why the "motor row entertainment district" will likely never take off. It would be a haven for this woman's son and his thug, gang-banger buddies. Interesting Anon@ 9:17am..Thanks for sharing. Here's the link to her article in case anyone is interested. Mary Mitchell drives me crazy!